Years before the intervention of Bill Ackman in December 2012, I was openly saying that the legally-registered, so-called 'Multi Level Marketing' company known as 'Herbalife,' has been part of an ongoing criminogenic phenomenon of historic significance. 'Citizens for Responsibility and Ethics in Washington (CREW),' claims to be a non-partisan watchdog organization that targets both Democrats and Republicans for corruption. Whenever I come across self-righteous individuals, and/or organizations, steadfastly pretending moral and intellectual authority (particularly, in Washington DC), one common-sense question immediately springs to mind, 'Quis custodiet ipsos custodes?' 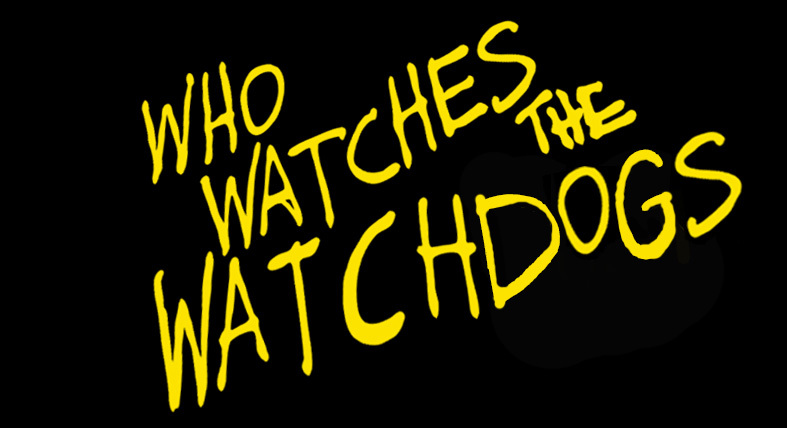 - Who will watch the watchmen? Talking of persons pretending moral and intellectual authority, 'CREW' has, in fact, been heavily-financed (to the tune of $800 000) by George Soros' 'Open Society,' and that fact, casts a huge doubt on the real motives behind 'CREW's' recent, reality-inverting public intervention in the ongoing 'Herbalife' vs Bill Ackman, Wall St. saga; for at the beginning of August 2013, it was reported that the Soros Hedge Fund had bought a large stake in 'Herbalife,' causing shares in the counterfeit 'direct selling' company immediately to jump 9%; for it was also implied that the messianic billionaire, George Soros, had personally been responsible for making this trade. 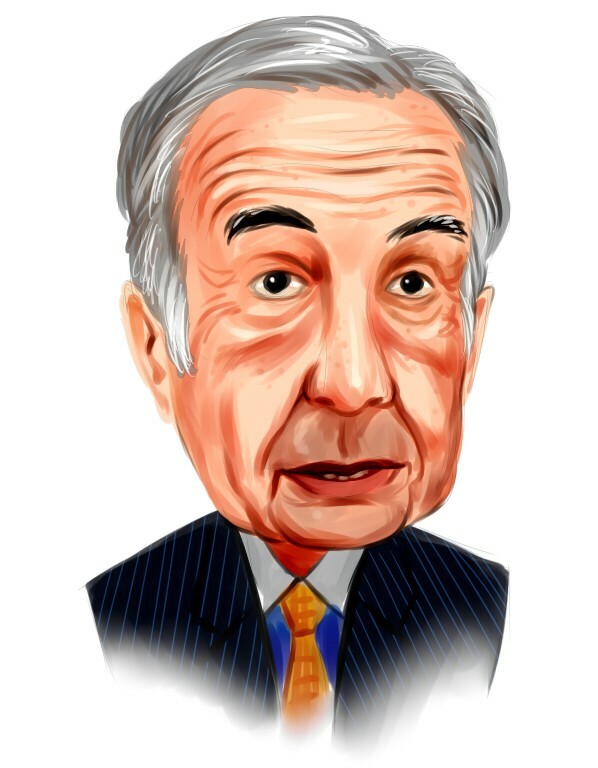 The temporary re-inflation of the market price of effectively-valueless 'Herbalife' shares, meant that (on paper) Bill Ackman was around $300 millions down on his $1.2 billion short-selling bet that 'Herbalife' is a fake enterprise which will soon be closed down, whilst (again on paper) Carl Icahn and the Soros Hedge Fund, were hundreds of millions of dollars up on their own long bet against Bill Ackman's short position. According to documents obtained by 'CREW' through a Freedom of Information Act (FOIA) request, Ackman’s lawyers regularly contacted Lois Greisman, the Associate Director of the Division of Marketing Practices at the FTC, with emails attaching articles and blog posts critical of Herbalife. CREW says that many of these messages 'appear to have been ginned up by Ackman or his supporters. As a result of a recent, re-intensified, coordinated propaganda campaign to paint Bill Ackman as an unethical and dishonourable criminal, the market price of effectively-valueless 'Herbalife' shares has again begun to re-inflate. During 2013 and 2014, 'Herbalife' committed almost 5 times as much on lobbying the US government as Ackman did. 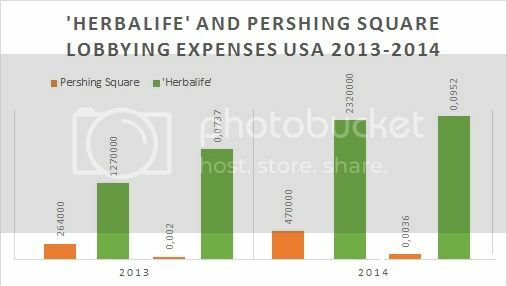 When the lobbying expenses are calculated as a percentage of total company assets, the difference for 2013 and 2014 (respectively), is that 'Herbalife' spent 37 and 26 times as much on lobbying as Pershing Square. Not surprisingly, 'Herbalife' has significantly increased its lobbying budget since Ackman announced his short in December 2012. 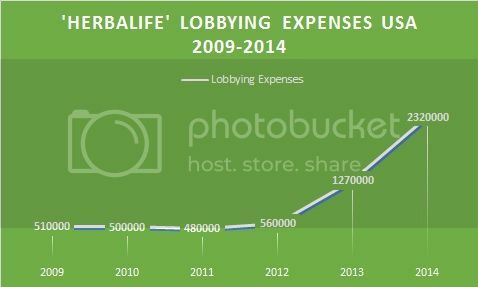 For many years, 'Herbalife's' annual lobbying budget remained around $500,000, but during 2012 to 2013, this figure doubled and is expected to double again during 2013 to 2014. In the first half of 2014, 'Herbalife' had already spent more than $1 million on lobbying. This was already equal to the total lobbying budget for 2013. 'Herbalife' steadfastly pretends to be an entirely legitimate 'direct selling enterprise' and part of the 'nutrition industry.' In which case, 'Herbalife' should consider companies like Unilever and Procter & Gamble to be its main competitors. However, these companies spend only a fraction of their revenue on lobbying compared to 'Herbalife'. As a percentage of annual turnover, 'Herbalife' has lately been spending 3 and 5 times (respectively) as much annually as P&G and Unilever. In 2014, these highly-revealing figures have climbed to an estimated 7 and 12 times (respectively). Furthermore, 'Herbalife' mainly lobbies on issues related to 'trade and finance', whilst authentic nutrition product manufacturers, such as Unilever and P&G, focus on health related issues. When people are asked which industries they would expect to spend the most money on lobbying? - weapons, tobacco, oil and pharmaceuticals are the most often heard replies. Few people (if any) mention the nutrition industry. Yet, by comparing the lobbying expenses of 'Herbalife' to big tobacco, oil, and pharmaceutical companies, we find a remarkable picture. 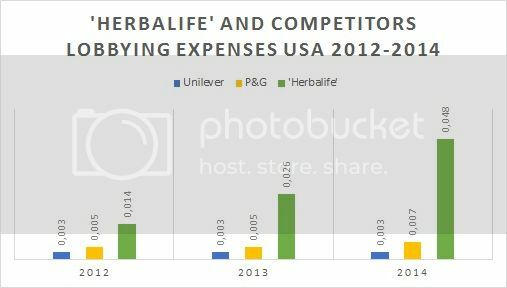 The increase in lobbying expenditure made by 'Herbalife' following Ackman's short, has placed this alleged'nutrition company' on pole position in comparison to weapons manufacturers, tobacco producers and oil, and pharmaceutical, companies. 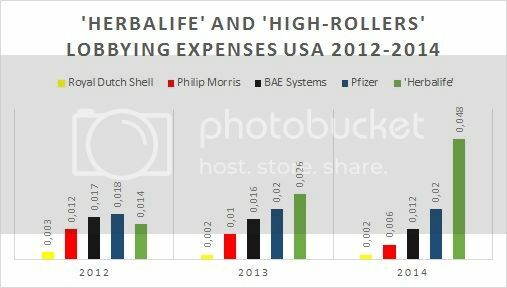 While during 2012 'Herbalife' only managed to outspend Royal Dutch Shell and Philip Morris (from this list), subsequently, the 'Herbalife' racketeers have put even the highest (lobbying) rollers such as Pharmaceutical giant, Pfizer, to shame. 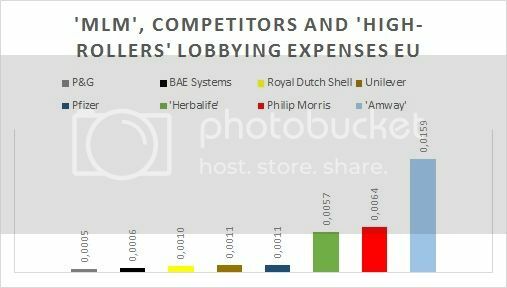 As a percentage of annual revenue, 'Herbalife' will lately spend more than twice as much on lobbying as Pfizer, 4 times as much as BAE Systems, 8 times as much as Philip Morris, and a staggering 24 times as much as Royal Dutch Shell. The lobbying activity of 'MLM' racketeers has not been limited to the USA. Like Philip Morris, both 'Amway' and'Herbalife' have found their way to Brussels. 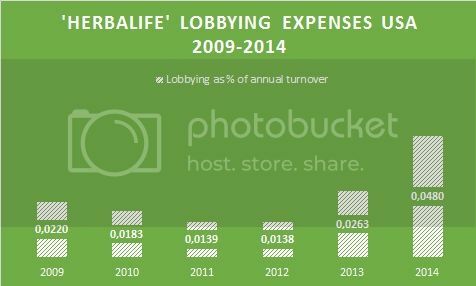 Not surprisingly, the lobbying activities of 'Herbalife' in the EU are slightly less shocking than in the USA. 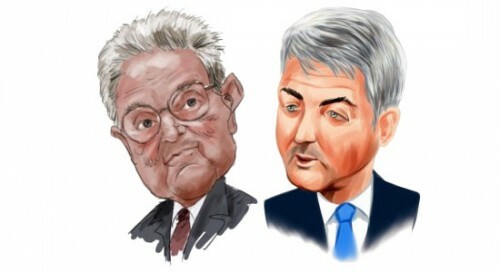 So far, Ackman's short has only made regulatory action imminent in the USA. THE 'Amway' bosses however, have committed a vast amount of stolen money to persuading EU officials to allow them to continue to thieve from the citizens of Europe - currently, almost 2 millions euros per year (and that is only what has been officially declared). In the European Union, compared to authentic commercial companies and the highest (lobbying) rollers, both 'Herbalife' and 'Amway,' are on the lobbying pole position yet again. Although 'Herbalife' has been spending more than 5-10 times as much as Pfizer, Royal Dutch Shell, etc., on lobbying in the EU, Philip Morris did manage to spend slightly more than 'Herbalife.' However, 'Amway' massively outspent everyone. As a percentage of annual revenues (in $), the EU lobbying costs (in €) of 'Amway' are almost three times as high as those of Philip Morris, and a staggering 26 and 32 times (respectively) as much its alleged competitor, P&G, and weapons manufacturer BAE Systems. - All total lobbying expenses for 2014 are projected (i.e. the amounts reported for the first half year were doubled). - 2013 revenues were used to estimate 2014 revenues. - To avoid issues with exchange rate differences, the percentages for the EU were calculated using lobbying expenses in euros, and turnover in US dollars. Presumeably, the fact that Madeleine Albright is no longer in government, explains why those tenacious watchdogs at 'CREW' don't have the slightest interest in her financial connections with racketeers. 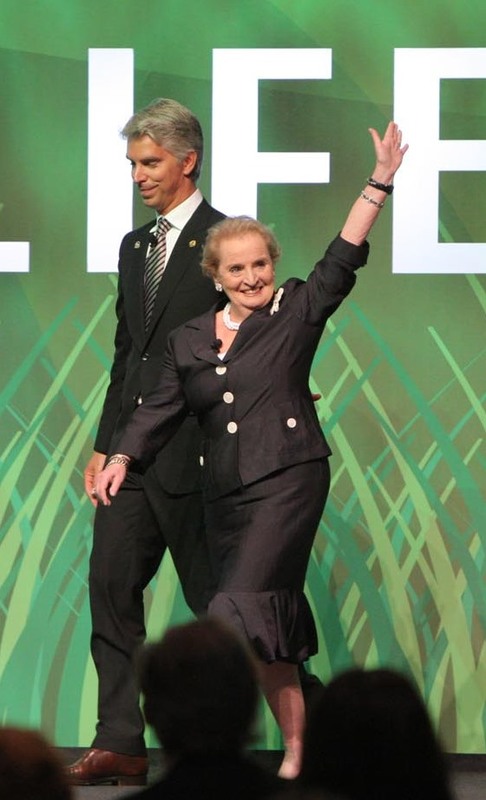 During the last 7 years, Madeleine Albright's company , 'Albright Stonebridge Group,' has received approximately ten millions dollars from the 'Herbalife' mob. In return for this pile of stolen cash, Ms. Albright has betrayed every single value that she (and her late father) ever claimed to have stood for, by enthusiastically participating in committing fraud and obstructing justice. 'Herbalife's' most-useful idiot, Madeleine Albright, and her associates, can have absolutely no moral or intellectual justification for holding onto the ten millions pieces of stolen silver they have received from the bosses of the 'Herbalife' racket. "...all of the King's horses, and all of the King's men couldn't put Humpty Dumpty back together again!" quixtarisacult - This what we know 'Humpty Dumpty' has been doing in public, so imagine what he's been getting up to in private. Yesterday, I tried in vain to get Anne Weismann to give her version of events. I particularly wanted to know if she considers 'Herbalife' to be an entirely lawful enterprise? I also wanted to know what Ms. Weismann had to say on the subject of John Peterson - the exemplary multi-millionaire 'Herbalife' shill / under-boss who took the 'Herbalife' racket to Mexico and who was facing federal investigation for peddling so-called 'leads,' but who was found slumped in his upscale pickup truck, parked outside his upscale Colorado home, with a bullet in his head. It seems that Mr. Peterson couldn't simply be air-brushed out of the 'Herbalife' fairy story like so many other shills have recently. This was probably, because he knew too much. Local law enforcement agents said that Peterson had committed suicide, but the list of wealthy 'MLM' income opportunity bosses in whose interests it was to be rid this troublesome shill, is almost endless.